This #WeBelongWR story about Christina moving towards her goals comes to us from Bridges to Belonging. Thanks to Christina for sharing her story! Christina is a warm, creative and playful 28 year old living in Cambridge. “I make friends really easily. People are naturally drawn to me,” Christina notes. Her love for travel, cooking, and words is shared by her family. Travel plans keep people coming and going in the house she shares with her mom, two brothers, stepfather, and service dog Jester. Christina herself is studying to become a travel agent through Conestoga College, following in the footsteps of her mother Cathy. Independent Facilitation is a key resource for Christina and her family, as she journeys towards greater independence. Though change can be uncomfortable for Christina, she appreciates this process of building a life lived according to her own interests and on her own terms. Before being involved with Independent Facilitation Christina had already experienced some big achievements. When Jester, her seizure response service dog, entered her life in 2013, Christina began to be able to sleep through the night without fear, and make it through medical procedures on her own. Jester’s training helped her to be less apprehensive whether at home or out in public. The Big Fella, as Christina describes him, was a new source of support for Christina. She found some ease in everyday life that she hadn’t previously thought possible. It was during this period of emerging confidence and independence that Christina welcomed Danielle into her life. “There was no checklist,” explains Danielle about their work together. Independent Facilitation happens organically. “It’s a process. It’s a lot of figuring out. A lot of trust building.” Danielle invited Christina to share some of her favourite pastimes with her. Christina loves cooking healthy foods, riding her horse Lionel, colouring, and painting pottery. 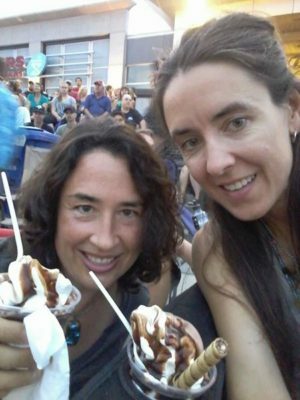 By doing the things she most enjoyed with Danielle, Christina taught Danielle about herself. “Being with Danielle brought out my creativity even more. I could show her what I can do. How I shine,” Christina shares. Christina and Danielle’s relationship is flexible and fluid, guided by Christina’s goals. Nothing is fixed in stone. Christina and Danielle often text together in between visits. “We talk about goals all the time,” Danielle explains. “And how to get there. And how to break them down. It’s a constant re-evaluation, like all of our lives.” When they focus on an immediate issue, like getting through a tough exam, Christina is in the lead, with Danielle as support. While Christina does all the work of preparing for the exam herself, Danielle is with her, helping her to break down the problem, and supporting Christina to find new strategies for coping. “Such a calming influence,” Christina says to Danielle. “No you are,” says Danielle. “No you are!” says Christina. The room fills with laughter. One example of the flexibility in the Independent Facilitation process came as Christina worked on becoming healthier. Gyms were unappealing to Christina, someone who often feels uncomfortable in large groups and public settings. Danielle reached out to her network of independent facilitators to find a gym that might feel more welcoming, and found it in Active Souls. 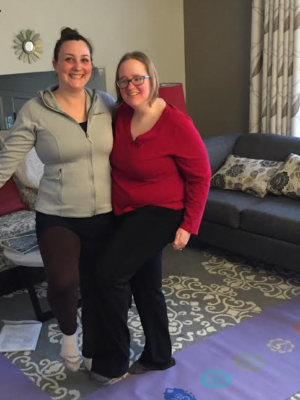 Though the fitness class itself did not meet Christina’s needs and was difficult for Christina to get to independently, the connections made at Active Souls were rich with possibility. With Danielle’s support, Christina created a new fitness plan. Now she meets regularly with Lindsay, one of Active Souls’ personal trainers, in her own home for yoga practice. Christina’s mom Cathy loves to listen from her office as Christina and her trainer breathe, stretch, and laugh together. As an Independent Facilitator, Danielle is a neutral person with whom Christina can dream and make plans. The trusting relationship that Christina and Danielle have built together becomes very important when it comes to big issues. Housing is a topic that has long been off limits between Christina and her mom. Cathy hoped Christina would move out before she was thirty, but that idea made Christina fear that she was being abandoned. Danielle has helped both Christina and Cathy understand that housing can take many different shapes, and doesn’t have to be all or nothing. “There’s a program we’ve just started called Be At Home, for creative housing ideas,” Danielle explains. 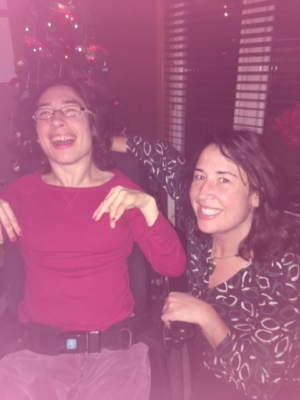 “We can match people up to just dip a toe in and try it out.” Gradually, with Danielle’s support, Christina is taking steps to figure out what creative housing could look like for her, on her own terms. Christina recently wrote out her achievements, the words flowing with pleasure and pride. From completing a challenging college course, to nurturing special relationships as an aunt, her energy sparkles off the pages. 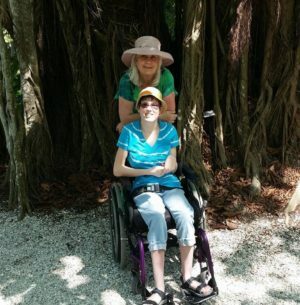 Present in each line is the underlying story of Christina’s growing confidence and independence. By paying attention not only to who Christina is but also to her context, Danielle has helped Christina and Cathy to identify new and unexpected connections and pathways forward. This is one of the gifts of Independent Facilitation. It is a slow, ecological process that includes the person and the significant people in the person’s life. For Christina, this process is creating the space she needs to develop her own story of strength and discovery. This #WeBelongWR story introduces us to Tim and his experience with Bridges to Belonging. Tim is a charismatic, positive, friendly man who lives in Waterloo Region. He has two college diplomas, from Seneca & Conestoga College in Chemical Engineering and Environmental Engineering and is currently working on his third. In late 2015, Tim became involved with Bridges to Belonging, and was paired with Chaitali, his Independent Facilitator, to help him set goals and become connected with his community. 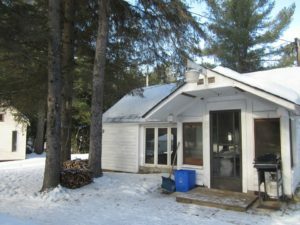 When Chaitali and Tim first met, Tim expressed some feelings of isolation, which prompted his first goal of connecting to more people. They began their journey by attending numerous community events such as Earth Day Eco Fest, the Dignity March, Jazzfest, and Indian Cultural Events. Chaitali and Tim have also explored many new hobbies such as Pickleball at RIM Park, as well as going to the movies with his friends. One of their favourite things to do now is go to Games on Tap together twice a month with a group of individuals. They have now worked their way up to quite challenging games, and Tim has taken the lead by coordinating the games. His favourite game? Superfight. He explained how it helps with his debate and conversation skills as the players are asked to select a super hero, and grab 3 attribute cards to pair with their hero, while debating and defending their choices throughout. Tim is also very good at Mensa games and has made many friendships with the individuals in the group. Since they started at Games on Tap over a year and a half ago, there are now 8 regular friends who join them, and the group is continuing to grow. Chaitali gushed that “he is a great motivator!” as Tim is now encouraging his friends from Games on Tap to also set goals such as seeking paid-employment. Over the past year and a half with Chaitali, Tim has made meaningful connections with members of his community, and is confident enough now to explore many of these opportunities further on his own without the assistance of his Independent Facilitator. Some of the bigger goals that Tim has set included finding a part-time volunteer experience, which has recently begun. Tim is now a volunteer Mathematics Tutor at Frontier College, which he “considers an honour due to the College usually only accepting university students”. As a college student, Tim feels like they made a “wonderful exception” for him. Tim is now teaching Number Ninjas for the first time, working with kids to “make math fun” by incorporating the use of games to assist in mathematical concepts. Chaitali grinned with happiness as she explained how “great Tim is at teaching!” Chaitali assisted in many of the steps leading up to this opportunity, including helping Tim get a Police Check. Tim also wanted to increase his positive health behaviours, which included filling up his schedule to keep his time busy, attending local cooking classes (Tim now makes a delicious Miso soup) and stress relief practices. Sometimes exploration takes trial and error experiences, and Tim explained a time when Chaitali took him to a stress relief Mandala Drawing workshop. Although he enjoyed the colouring aspect, he did not find the workshop relaxing, but he agreed to try it once and from there they explored other options. They have now found that a good source of stress relief for Tim is reading books, so they find themselves frequently at Chapters together exploring book titles. Goals revolving around organization and increased planning skills have also been achieved to the point where Tim is almost too busy to fit Chaitali into his schedule! 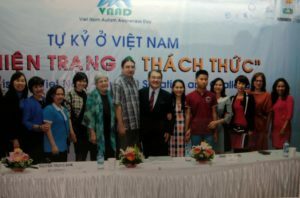 Yet another massive accomplishment that Tim has made since paired with Chaitali is an international speech in Vietnam with Autism Awareness. Tim, alongside his parents, travelled overseas so that he could tell his story to a large group of high ranking individuals. Chaitali and Tim in the weeks of preparation constructed a speech and PowerPoint presentation. Leading up to this experience Chaitali also found a self-advocacy, speech group with Extend-A-Family Waterloo and felt that Tim could gain a plethora of skills from attending including eye contact, confidence and clarity. After the international speaking opportunity, Tim now continues to attend the speech group without Chaitali, getting great feedback from the judges involved. Tim and Chaitali have conquered a lot of goals in the past year and a half and do not plan on slowing down. Looking into the future, Tim has large goals that he will be tackling with the assistance of Chaitali and Bridges to Belonging including finding paid part-time employment. Tim is currently enrolled in Quality Assurance courses part time in the evenings, which will hopefully get him to his final goal while Chaitali will be assisting with the resume writing process, searching for job opportunities and interview preparation. He is taking all the right steps towards being job ready by recently attaining his First Aid & CPR training certificate on top of his recent volunteer opportunity. All of these aspects will increase his confidence and skill set for future endeavours. With his strong and ever-growing initiative and communication skills, Chaitali is confident that Tim will find employment. Currently, Chaitali is setting up opportunities for Tim’s goal of independent living in the community by working with Jessica from Bridges to Belonging’s project Be At Home to explore Tim’s creative housing options. This summer Tim and Chaitali are also planning on trying new hobbies such as lawn bowling, and increasing his independence by focusing on bus training with the GRT. Tim is very proud of his progress so far with the assistance of Independent Facilitation and is excited for what is to come. This #WeBelongWR story introduces us to Barb and her experience with Bridges to Belonging. This story was written for the Kitchener and Waterloo Community Foundation, and is included in their 2016/17 Annual Report. You can read their full report here. There are four things on Barb’s bucket list: to go swimming, to sing in a choir, to belong to a church and, eventually, move out of the rural nursing facility that has been her home for seven years. Barb, 58, is a good couple decades younger than most other residents. It was her husband’s illness that landed her here—“I just tagged along,” she says, though she herself lives with epilepsy and developmental challenges. Since he passed away, not knowing how or where she could go, she stayed put, hardly ever leaving the facility. “It makes for a pretty isolated life,” says Lorna Aberdein, whose job, simply put, is to help people achieve their dreams. Lorna and 10 other Independent Facilitators with Waterloo Region’s Bridges to Belonging provide person-directed planning and facilitation for 130 individuals with developmental disabilities or mental health concerns. 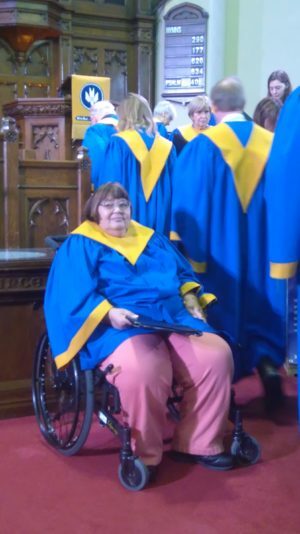 Since the writing of this story, Barb has reached her next goal – she is now a member of the St Andrew’s Church and Choir! What’s in it for Lorna? Well, it is more than a job. “I love to have an impact on someone’s life.” Lorna, also 58, has some formal training but also lots of life experience: her daughter lives with Down Syndrome. Singing with the Waterloo’s “Buddy Choir” has had the biggest impact on Barb’s everyday life. Lorna accompanied her initially but now Barb attends on her own and she and many choir members have become fast friends. “Thank goodness, ‘causeI can’t sing for the life of me!” laughs Lorna. Next on Barb’s to do list? Attending service at St. Andrew’s in Kitchener. “I haven’t been to church since my twenties. I feel like my prayers have been answered,” says Barb. This #WeBelongWR story and video comes to us from Bridges to Belonging. This #WeBelongWR share comes to us from Bridges to Belonging care of Mackenzie, Anthony, and Fitsum! This video is a combination of different places MacKenzie has performed. It was edited by another Bridges to Belonging Participant, Anthony Tamming. He and BtoBe volunteer Fitsum have been working on filming and editing skills. This post comes to us from Kim Sproul of Extend-a-Family. The Art of Belonging webinar will be hosted in Waterloo Region by Planned Lifetime Networks, New Story Group, KW Habilitation, Extend-A-Family Waterloo Region and Bridges to Belonging Waterloo Region. Here in Waterloo Region, we have many people, places, organizations and initiatives all vested in a single, shared dream – a Waterloo Region where all experience a warm, inviting sense of belonging. If I were to name only a few, like House of Friendship’s John Neufeld, along with his dedicated Board members, staff and volunteers have made belonging a central tenant to their vision of a healthy community. Then, of course, there is Waterloo Region Immigration Partnership, comprised of organizations and community partners in settlement, health, community, social services, business, and employment and education systems. Within their work, they have focused on three pillars, one of which being belonging. The Kitchener Downtown Community Health Centre completed a survey, polling for data on the importance of belonging on one’s health. We also have a Community Foundation that uses the concept of belonging to better understand the needs in this particular community, publishing Waterloo Region Vital Signs. They have entire granting streams dedicated to projects that strive to address and increase belonging in our beloved community. Then, of course, there is the developmental sector within which I work, where organizations like Planned Lifetime Networks, New Story Group, KW Habilitation, Extend-A-Family Waterloo Region and Bridges to Belonging Waterloo Region, have made a firm commitment to the concept. What becomes apparent is that this concept of belonging is integral to our community. We seek it, study it, look to increase it, and finally, we are eager to celebrate it. We are eager to hear the stories where people share testimony about how belonging has shown up in their life. How it has made significant impact on their everyday story. This need to celebrate is why we are so excited to bring The Art of Belonging to Waterloo Region. We are eager to share in the celebration and learning that Partners for Planning is hosting in Toronto, where they invited six very special guests to share their stories. We are eager to engage in this very same conversation, locally, on the power of belonging and community. It is our hope that by tapping into these amazing speakers, we can help continue and further the story of belonging in Waterloo Region. Think new thoughts. Ponder different perspectives. Consider contextual and/or cultural variations. We hope that many different people, from many different walks of life, will consider joining us on March 30th at TheMuseum for this free event. With time both before and after the speakers, we hope attendees will feel free to bring a local context to the stories we are hearing – find the parallels, the similar struggles and the powerful victories. Check out the Eventbrite link to find out more, and to reserve your spot, as space is limited. In light of the tragic terror attack in Quebec City, the Buddy Choir wanted to counter hate with love, and “send some love to our Muslim friends.” Please enjoy “Today I’m Gonna Try and Change the World” performed by The Buddy Choir. See.me. More alike than different. For the month of October, the Waterloo Region Down Syndrome Society has been sharing pictures and quotes with our community as part of their See.me. campaign. We connected with Kate Herron and Colin Domm to hear more about the campaign and to share their initiative with #WeBelongWR. You can see all of the See.me. posts on the WRDSS Facebook page, and you can also buy their 2017 calendar here. “This campaign is called ‘See Me’. What do you want people to know about you? What do you give to your family, friends, and community? When I say the word belonging, what does it mean to you? Where did the idea for the See Me campaign come from? “It came from a good friend of mine, Hilary Gauld-Camilleri, who was the photographer for the calendar. I approached her about shooting our calendar and she decided she wanted to help us use her social media presence to make a big lead up to the calendar release and Down Syndrome awareness week. What is WRDSS trying to achieve with the See Me campaign? What do you hope people take from this campaign? This #WeBelongWR story comes to us from Bridges to Belonging. In it, Desiree tells about the difference that Independent Facilitation has made not just in her daughter Kelsey’s life, but in the family’s life. Thanks for sharing! “At age 21 our daughter Kelsey finished her high school program. Where she had been spending her days in school, we were unable to find any suitable/affordable day programs for her to fill her now empty days. I was working part-time as a PSW the hours she was attending school, however, as she needs support throughout the day, I had to leave my job because it didn’t make sense to hire help for her.